To help you trace what the Lord Jesus was doing during each day of Easter Week, we have created a Bible reading plan beginning Palm Sunday (3/25), and ending on Easter Sunday (4/1). You can find each day's reading below. May these readings draw us all deeper into the gospel story and lead us face to face with Christ Jesus by faith! Easter Week is when we remember the death and resurrection of the Lord Jesus Christ. It is the highest season of celebration for disciples of Jesus, when we see on full display the undeserved love of God for us on the cross and the victory He won over sin and death at the empty tomb. This week will also mark the 5th anniversary of Grace Alameda! Our church launched on Easter Sunday, March 31, 2013. God has been at work among us in such generous, unforeseen, sometimes painful, but always gracious ways in the past 5 years. To give sufficient time to our anniversary celebration, we will be having a party on April 15 after church! Easter is a unique opportunity to invite our friends and neighbors to church who wouldn’t come otherwise. 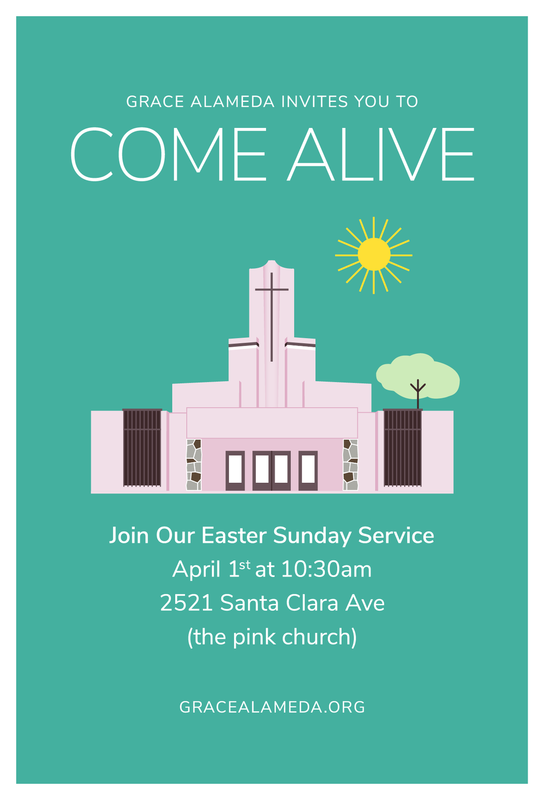 Our theme on Easter Sunday will be “Come Alive.” The sermon will be from Romans 8:9-11, and everything we do on Easter will be geared towards worshiping Jesus and inviting newcomers to enjoy new life in Him. Our Design Team has put together an invitation for print and social media sharing. We are encouraging all of our members: invite your friends, family, neighbors and coworkers to worship Jesus with us on Easter Sunday! We are praying that the Spirit would pack out our sanctuary on Easter and that He would move powerfully in people’s lives! We are calling the church to a week of prayer and fasting. Each day of that week (beginning Monday, 3/25), we will send out a prayer topic for the church to keep in prayer. During that week of seeking the Lord together, we want to encourage you to fast. You may choose to fast from food, from technology, or from something else to help you focus more deeply on the meaning of the cross and resurrection. A major topic of prayer will be for Alameda and the East Bay, and for our neighbors who don’t know Jesus. May the Lord bring people to new life by faith in Christ this Easter! We have created a Bible reading plan to draw us all deeper into the gospel story beginning Palm Sunday (3/25) and ending on Easter Sunday (4/1). May it lead us face to face with Christ Jesus by faith! Easter Sunday Worship! - 10:30AM at 2521 Santa Clara Ave.
Take a handful of invitations this Sunday and next to hand out to your neighbors and welcome them to worship with us! I am excited for Easter Week and the privilege of seeking together with you the Lord Jesus who suffered, died, and rose for us. I pray this is an opportunity for us to recalibrate our hearts in line with heaven’s agenda for our lives and our church. And I pray you are built up and Christ is glorified through it all!